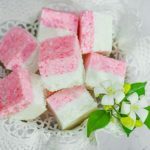 Keto Candy Coconut Ice is a very sweet snack but no sugar added. We use only all natural sweeteners with delicious flavors and fats that will give you energy fast. In a bowl mix together the shredded coconut, erythritol, stevia and vanilla with a hand blender on low. 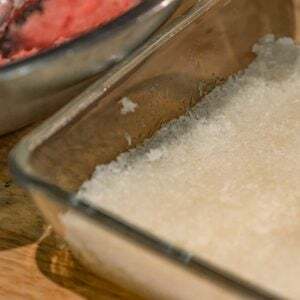 Add the melted coconut oil to the shredded coconut mixture and mix well. Press half the mixture into an 8in square dish and set aside. 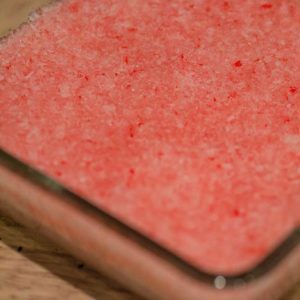 Add the food colouring and strawberry essence to the remaining mixture and mix well. Press the pink mixture on top of the white mixture in the square dish and set in the fridge for 1 hour. After the coconut ice is set, cut into 16 pieces and enjoy!